Treasure Chest Rentals offers a unique collection of furnishings and accessories for gatherings of any size: Weddings, Bridal Showers, Baby Showers, Birthday Parties, Anniversaries, and Company Parties. Photography Props, Trade Show Booths, Holiday Events. Our talented members are available to assist you with making sure all of the details are in place, so you can enjoy the party. Are you planning a special event? 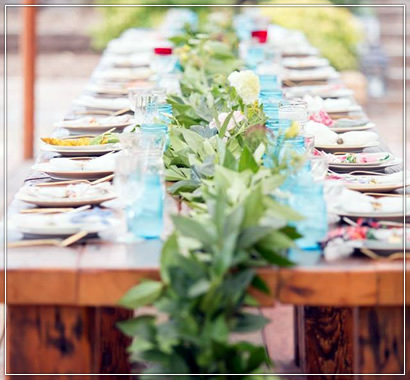 Our professional team would love to service your next event: Bridal Showers, Baby Shower, Anniversary, holiday parties, or a Pig-Roast in Grandma’s backyard. Let’s Treasure Chest professional rental coordinators help you achieve your vision. Our beautiful and unique collection include: 100 year old Barn Wood tables, vintage folding chairs, tabletop necessities (China, Crystal, Silver, Vases and Vessels), lounge furniture, wine barrels, arbors, chandeliers, and much more. For those requesting our boutique rental items please submit a “Wish List” of items that you would like to rent on our contact us page, and we will return an itemized “Package Rental Estimate” via e-mail. If you agree with the estimate a Formal Proposal and Rental Agreement Contract will be sent for your review. This proposal is valid for two weeks. Is there a minimum rental fee? The minimum rental fee is $50.00 unless requesting delivery on weekends. Weekend delivery requires a minimum of rental fee of $300.00, (Friday, Saturday and Sunday). Fees for delivery/pickup, setup and/or truck transportation are available upon request. Is a down payment required to reserve my item? After reviewing and agreeing to Rental Agreement you will receive an online invoice. In order to reserve your specific boutique rentals a required 50% non-refundable down payment by credit card is required. The final payment of the remaining 50% is due no later than 3 days prior to your event, also using your credit card on file. Can I modify my rental order after my initial request? Yes, things change; you may modify your rental items or installation services, but please note that the revised total fee shall not decrease by more than 20% of your original fee total. Also note that there are no refunds for cancellations of rental items made less than 30 days prior to your event date. Yes, we gladly offer delivery services within fifty miles of New Berlin, Wisconsin. Please contact us and we will try to accommodate further locations based on individual needs. Please note, certain items require a delivery and set-up charge with rental this includes all FARM TABLES and ARCHETECTUAL items as they are very heavy and require trained assembly. All other delivered items do not included set-up, installation and breakdown without additional fees. Delivery (except excluded items) will be delivered and picked-up within 100 feet of delivery vehicle clean and packed properly in same condition. Delivery fees are based on location items rented within a range from $100.00 to $300.00. Can my order be picked up from your facility? Yes, except excluded items listed above and providing you have proper transportation for your order, you or a designee may pick up your rental items at a mutually agreed time. We request that you be prepared to load and unload your own vehicle. Please note that if rental items are not picked up and returned at the scheduled time to avoid additional fees. Note also that all rental items shall be returned in their original condition and packing to avoid additional fees. All dining service ware and drink ware come to you clean and ready to use. We ask that all food service items be rinsed free of food immediately after use, wrapped in the provided packing paper and packed in their original containers. Votive holders and candleholders should be returned free from wax, linens and textiles vary in their uses with or without contact with food, drinks and candle wax please ensure rentals are protected. All other items should be returned clean to avoid a cleaning fee, which may include professional cleaning fees on upholstered items and/or re-painting fees on chalkboards where liquid chalk has been used. Fees vary depending on extent of cleaning required. What are the charges if an item is broken? The customer is responsible for items from the time of delivery until the time of pick-up, and in the case of will-call items, the customer is responsible from the time of pick-up until the time of return to our facilities. Please report any damaged or missing items prior to the event or the items will be considered received and in good condition. Please ensure that items are secure at all times and protected from the weather to avoid additional fees.